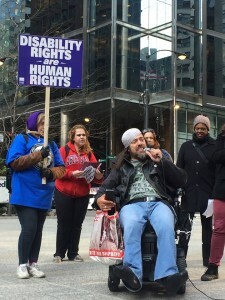 Chicago ADAPT (American Disabled for Accessible Public Transportation) and friends staged a takeover of the Thompson Center, blocking elevators and stairs to make it clear to Governor Bruce Rauner that he needed to meet with them now. The Governor has been ignoring ADAPT’s requests for a meeting. ADAPT’s sit-in kept people from leaving and entering the building and sent a clear message to the Governor. One of many issues is making sure Medicaid stays on track. Disabled children in Guatemala are warehoused with 43 children in one room. Forty girls were killed and 130 children survived a fire after being brought to a special education school. The girls who died had been locked in a small room as punishment for an attempt to escape another home where they had been sexually abused. The surviving children spend their days lying on mats, tied to metal doors, or belted into wheelchairs. A British conservative councilor and special needs teacher caused a furious reaction after she asked on Twitter why people with disabilities who are considered “unfit to work” attended a protest march in London in March against National Health Service cuts and privatization. She accused them of making false claims to avoid work, sparking angry responses from disabled marchers, campaign groups and the relatives of the terminally ill. This entry was posted in Articles and tagged Bruce Rauner, Chicago ADAPT, Disabled, Fire! !, Guatemala, Handicap This!, London, Medicaid, National Health Service, privatization, special education school, Suzanne Rose, Thompson Center. Bookmark the permalink.